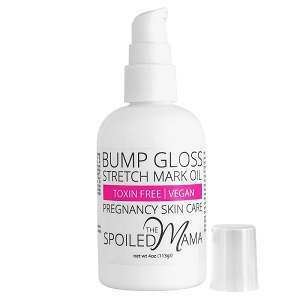 Here is our review of the Spoiled Mama Bump Gloss Stretch Mark Oil for pregnancy and postpartum stretch marks. The Spoiled Mama offers a fully Vegan solution to treating stretch marks on those vulnerable areas including the tummy, breasts, bottom, and hips. It targets the production of collagen deep in our skin using essential oils, and natural butters to repair dermis, and maintain healthy elastic skin to protect against and reduce future stretch mark problems. To know more about the Spoiled Mama product then read on for all the essentials. The ingredients are really very rich, and unlike many similar formulas the essential and natural oils here are totally undiluted by water. All of the ingredients aim to moisturize, nourish, and repair your skin, while giving you longer-term, healthier skin which can protect and guard itself better against future problems. There really isn’t anything included in the ingredients list for the Spoiled Mama Oil which isn’t necessary. That is to say that there are no added ingredients, absolutely everything here is an active ingredient for your body. Twice per day during and after pregnancy. Do apply modestly as oil isn’t like butter, and really spreads around on the surface of the skin. Unfortunately this means you should watch out for greasiness, though on the plus side it does mean that a little can go a long way. The ingredients are designed to be soothing, and to give a massage to relieve skin on application, so take your time to apply in a gentle circular motion. There are no associated side-effects with using any of these ingredients though, so don’t fret too much about how much you’re using. For a 4 oz container with a pump for easy application the price is $34, or the 2oz can be picked up for $21 (without the pump). For the distance 4 oz of oil goes the price is really really reasonable, and for such a premium product, buyers might not believe their luck. They recommend that you use the oil alongside their belly butter product, which brings the overall price up to $55 or so, but which isn’t absolutely necessary. Also you can pick up discounts if you spend over $100, as well as free delivery which is usually a $ 6.95 flat rate fee. Unfortunately I cannot seem to find a great deal of information regarding the guarantee policy, their website doesn’t feature any information, and Amazon advises to contact them directly for information. This is really great value for such a premium product, and if you’ve looked around much for such rich, natural, organic ingredients, you’ll know that the price can often be up there. Also I think it’s great that they take care of their workers using fair trade friendly manufacturers. Everything about this product looks fantastic, the only really significant down-side is, no guarantee. As much as the Spoiled Mama Oil might seem to tick all the boxes; it just seems to be fatal that in a market where so many are bold enough to offer full refund guarantee; that none is offered by the Spoiled Mama range. One other thing is that the item is supposed to be used alongside a cream, though most products now integrate the two together. For $55 the price doesn’t turn out to be less handsome than it first seems. David Carney	reviewed The Spoiled Mama Bump Gloss Pregnancy Stretch Mark Oil	on July 12th	 and gave it a rating of 2.5.